Mobile Doula is an iPad App with a cloud, which means your information is always with you and also securely backed up in a cloud location. The great thing about it being an app is that you can use the software even without Internet connection! Whether you are in a client’s home that has spotty Internet connection, or in the hospital or other location with no internet access, Mobile Doula still works exactly the same! You can also use it with your iPhone, so it’s very versatile. What features does Mobile Doula have? Labor Support Forms is digital! 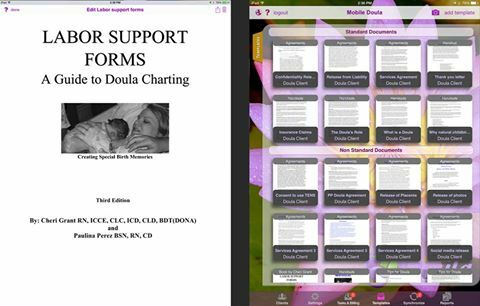 Mobile Doula has partnered with the authors of the newly released 3rd edition of “Labor Support Forms – A Guide to Doula Charting”. This edition is not just a book; the doula forms have been integrated into the Mobile Doula iPad app in an interactive way to help doulas everywhere go mobile and paperless. The Mobile Doula integration of the Labor Support Forms book includes everything you will need as a Doula, whether you are just starting out or have decades of experience under your belt! The Labor Support Forms book includes many forms, which are already built in to Mobile Doula as document templates that your clients can read and sign through the Mobile Doula Client Access portal. Cheri Grant, RN, ICCE, CLC, ICD, CLD, BDT(DONA) and Paulina Perez, BSN, RN, CD have put a century of combined experience into these forms that includes everything you can imagine, including helpful sheets to use when you encounter challenges during labor with a client, and even business marketing brochures. When you purchase this book though Mobile Doula you will receive all 184 pages plus many of the forms already fully converted to interactive document templates in Mobile Doula that your clients can sign using the touch screen. Go paperless with Mobile Doula today!